More opioid replacement therapy in correctional facilities might yield public safety and health benefits. An estimated 200,000 people with heroin addiction pass through U.S. criminal justice systems each year, and few of them receive methadone or buprenorphine therapy. In response to a nationwide survey, prison medical directors cited doubts about the benefits of the medications, cost, concerns about the security of supplies, and longstanding institutional policies among their reasons for not offering opioid replacement therapy (ORT). Nevertheless, says Dr. Josiah D. Rich of Brown University and Miriam Hospital in Providence, Rhode Island, omitting that evidence-based approach represents a missed opportunity for improved public health and safety. Dr. Rich and colleagues approached the medical directors, their designees, or health authorities of all 50 State departments of corrections, the District of Columbia prison, and the Federal Department of Corrections—which together house more than 1.5 million inmates. Only North Dakota did not respond. Fifty-five percent of the respondents reported that their prison systems provided methadone under some circumstances, but half gave it only to inmates who were pregnant, suffering from chronic pain, or undergoing opioid detoxification. Only 14 percent of the systems offered buprenorphine. From the survey respondents' estimated numbers of prisoners receiving the medications, Dr. Rich and colleagues calculated that only about 2,000 prisoners in the country receive ORT as an ongoing addiction treatment. Regions of the country differed in their provision of ORT during incarceration (see map). About 64 percent of systems in the Northeast, Midwest, and West offered methadone; only 35 percent of southern systems did so. Buprenorphine therapy was common only in the Northeast, where one-third of systems offered it. Overall, 45 percent of systems referred prisoners to methadone treatment upon release, and 29 percent made referrals to buprenorphine providers. Regionally, 78 percent of systems in the Northeast and less than half of those in the Midwest, West, and South recommended methadone programs to released inmates. The Northeast led in referrals of patients to community buprenorphine providers, with 67 percent. The percentages were less than 25 percent in the other regions. The majority of survey respondents, 57 percent, said they considered methadone to be very or somewhat beneficial for inmates with opiate addiction, and 27 percent said they did not know whether it is helpful. When asked about buprenorphine, 41 percent regarded it as useful for prisoners, and 49 percent said they did not know whether it is helpful. Respondents from systems that did not offer ORT or post-release referrals for it gave a variety of reasons. The most common, provided by 57 percent with respect to methadone and 39 percent with respect to buprenorphine, was that the respondent favored detoxification followed by avoidance of all opioids. Some respondents cited problems that might arise from ORT regardless of whether it is beneficial for prisoners. The most frequently mentioned, by about 20 percent of respondents, was the security concern related to the supply of opioids. Other reasons included longstanding institutional policies and—for buprenorphine—cost. 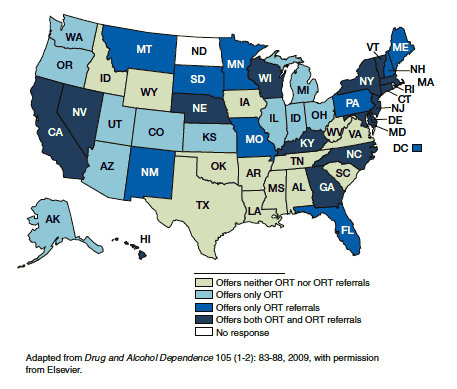 Provision of Addiction Medications and Referrals Varies Across Country: Regions differ in whether their State prisons offer opioid replacement therapy (ORT) in prison and whether they refer inmates to community facilities that provide these therapies upon release. Dr. Rich acknowledges that prison personnel who observe addiction primarily within the context of their institutions might question the benefits of ORT. "People working in the criminal justice system sometimes encounter individuals on methadone or buprenorphine who have been reincarcerated, and some may see this as a failure of the medication rather than viewing relapse as a symptom of a chronic disease," says Dr. Rich. "They may not see the many individuals who are stable on these medications and leading productive lives outside of prison." Yet from a broader perspective, says Dr. Rich, studies show that prison-based ORT reduces inmates' and ex-inmates' heroin abuse, HIV transmission, and re-incarceration (for example, see "Methadone Therapy in Prison Benefits Men a Year Out"). In recognition of these public health benefits, government and international agencies, including the U.S. Centers for Disease Control and Prevention and the World Health Organization, recommend that criminal justice facilities provide ORT for prisoners. At least 30 countries, some of them low- and middle-income nations, extend ORT to prisoners. Dr. Rich's findings suggest that more prison systems are providing methadone compared with several years ago, that the advent of buprenorphine has extended access to ORT to more inmates, and that more systems are providing referrals when prisoners are released. Nevertheless, says Dr. Rich, only a small fraction of prisoners who might benefit from ORT receive it or a referral for it. "The results of Dr. Rich's pivotal study indicate that evidence-based treatments are not reaching a population that needs them," says Dr. Jamie Biswas of NIDA's Division of Pharmacotherapies and Medical Consequences of Drug Abuse. "The investment in pre-release addiction treatment would likely cost less than the relapse, recidivism, and family problems that stem from ongoing drug abuse." Dr. Redonna K. Chandler of NIDA's Services Research Branch in the Division of Epidemiology, Services and Prevention Research agrees. She adds, "NIDA wants to work and talk with criminal justice professionals and decisionmakers about improving access and utilization of evidence-based therapies, including methadone maintenance."